To fly without an engine or fuel, man must continuously innovate new ways to take to the skies. This invention is an example of what our imaginations can accomplish with a bit of work and some knowledge of math and physics. This is a self-propelled, human-powered helicopter that can hover over 3 meters high for over a minute. The American Helicopter Society has offered the Sikorsky Prize since 1980, which is a $250,000 reward for a functional, human-powered helicopter. To win the prize, the human-powered helicopter must remain in the air for 60 seconds, and must reach a height above 3 meters at some point during that time. It must also remain within a horizontal area no larger than 10×10 meters. Cameron Robertson and Todd Reichert of the University of Toronto’s Vehicle Design Team and AeroVelo discovered great success on Kickstarter in their attempt to fund a vehicle called the Atlas. 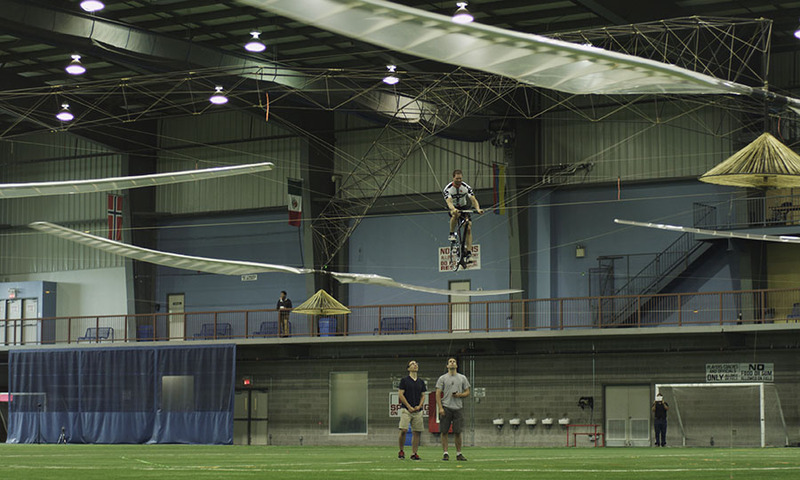 Atlas, the vehicle shown in the video above, has four rotors connected by a massive frame, and is powered by a modified bicycle in the middle. The design was tested and proven on June 13, 2013. We’re very excited for the world to learn about this exciting milestone in aviation history. At AeroVelo we hope to inspire people to take on great challenges and accomplish the impossible. We would like the public to understand that with innovative engineering and creative design we can find sustainable and environmentally conscious solutions to many of the technological challenges facing our generation. This incredible flight was 64.11 seconds in duration (World Record for “Duration on Hover”), reached a 3.3m peak altitude, and drifted a maximum of 9.8m. The Atlas as flown on June 13th behaved very differently from the aircraft we first flew some 9 months ago, a result of many incremental improvements and changes. In 18 months this passionate team went from preliminary design to achieving what many considered impossible, taking down one of the most daunting aviation feats of the past century. We have made available to the public the draft Draft FAI World Record Claim we will be submitting to the FAI (Fédération Aéronautique Internationale, or International Aeronautics Federation). The FAI is the international body which oversees all aviation records, and which certified the flight of the Snowbird Human-Powered Ornithopter in 2010. This document contains much of the evidence that we’ll be submitting for evaluation, as well as some other interesting data on the AHS Sikorsky Prize-winning flight. Enjoy! We at AeroVelo would like to extend our heartfelt thanks and sincerest gratitude to the American Helicopter Society and to Sikorsky Aircraft for their vision in establishing and supporting this monumental challenge. By their backing, these two organizations have demonstrated a continuing commitment to innovation and to the education of the next generation of young engineers. This shows quite clearly that the concept is solid, and that we can power a helicopter using only ourselves. How much longer do you think it will take until we can build a version that allows for ‘sustained flight’ using only human power, and how much do you believe such a vehicle would cost? Also, how long do you think it would take for the government to step in a regulate it? Let me know your thoughts in the comments below. Next story China Space Program Is Half a Century Behind Ours.